Our goal in a recent series of tests was to identify primer paints that worked successfully over WEST SYSTEM epoxy with minimal surface preparation. Specifically, we wanted to see if primers can be applied satisfactorily to partially cured epoxy. Applying primer to partially cured epoxy would have the advantage of allowing the contractor or homeowner to complete the entire repair from epoxy application to topcoat paint in one day. 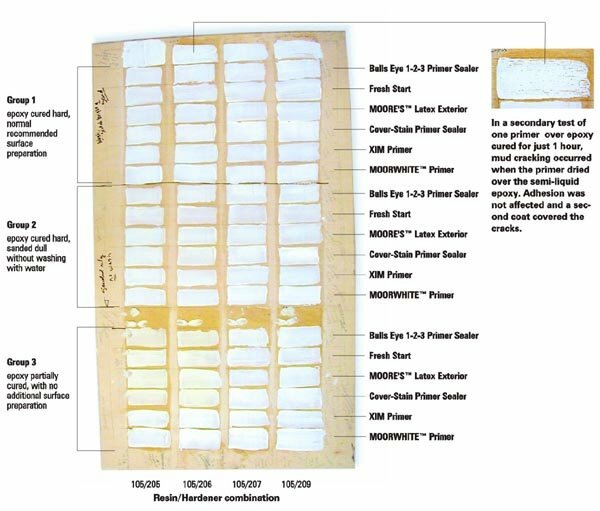 We tested six primers, including ones previously tested in 1996, that our technical staff has used over epoxy for years on home projects. We also included fairly new formulations that dry quickly and allow topcoat paints to be applied within an hour. The majority of primers selected were the fast-dry variety, but one was a slow-drying oil-base type. The test is fairly simple and something you can do yourself if your favorite paint is not included in our test. We started with a sheet of plywood and applied each of our WEST SYSTEM resin/hardener combinations to separate sections. The epoxy-coated sections were large enough to allow room for each of the paints to be applied three times. Each epoxy-coated section was prepared three different ways prior to applying paint. This was done to identify any paint drying or adhesion problems over certain resin/hardener combinations. Group 1 involved epoxy-coated samples where the epoxy had cured hard and had been prepared with our normally recommended surface prep of washing with water and sanding dull with 100 grit sandpaper prior to applying paint. Group 2 involved epoxy that had cured hard and had been sanded dull with 100 grit sandpaper without washing with water prior to applying the primer paints. Group 3 involved applying primer paints while the epoxy was partially cured, without any additional surface preparation. The paints were applied when the epoxy achieved a slightly tacky to soft “rubber like” cure. You may recall that this approach was first discussed in Epoxyworks 14, Fall 1999–Porch Railing Coating Analysis. By varying surface preparation on each of our resin/hardener combinations, we hoped to identify primer paints that worked well over a variety of epoxy cure and surface prep conditions. If there are paint types that have a problem curing over epoxy or if paints cannot adhere well to epoxy under certain conditions, we wanted to know. Our shop was 80°F and 70% relative humidity when the epoxy was applied. The high humidity was ideal for this test because if amine blush is going to form on epoxy, it will most likely occur when humidity is present. If blush has an effect on paint drying, we would see it in our results. Bulls Eye 1-2-3 Primer Sealer (water-based) from Wm. Zinsser Co. is an interior/exterior primer that dries in 30 to 45 minutes and allows recoating with latex or oil-based topcoat paints after one hour. It is able to adhere to a variety of surfaces with minimal surface preparation and offers bleed through resistance to bleeding type stains. Fresh Start™ from Benjamin Moore™ is 100% Acrylic Latex (water-based) primer that dries quickly and allows you to topcoat with finish paint (any oil or latex paint in Benjamin Moore’s line) within three hours of application. It is able to adhere to a variety of surfaces with minimal surface preparation and offers bleed through resistance to bleeding type stains. MOORE’S™ Latex Exterior Primer from Benjamin Moore & Co. is a fast-dry, water-based primer. It dries in one hour and allows recoating with topcoat latex paint in three hours. Cover-Stain Primer Sealer from Wm. Zinsser Co. is a white pigmented interior/exterior oil-based paint that dries in 30 to 45 minutes and allows recoating with oil or latex topcoat paints in one hour. It seals bleeding wood stains and can be applied to shiny surfaces without surface prep. XIM Primer is a quick-dry, solvent-based sealer/bonder that dries in 10 to 20 minutes to the touch and is ready for top coating with oil or latex paint in one to two hours. MOORWHITE™ Primer is an exterior grade alkyd primer that dries in 6 to 8 hours and can be recoated with topcoat paint after overnight drying. It is unique in that it remains a bit flexible and can be recoated with either oil or latex paints. Since this paint had a difficult time drying over epoxy in our 1996 tests, we wanted to retest it. All of the primers performed well when 1) the epoxy was washed and sanded or 2) when the cured epoxy was just sanded. Most also show encouraging results when 3) applied over partially cured epoxy. Adhesion testing of the paint films was done 24 hours after the paint was applied. A car key was dragged across the surface and the adhesion was deemed acceptable if the paint stayed attached to the epoxy. No adhesion problems were found when paint was applied to cured epoxy. When the paint was applied over partially cured epoxy, two of the paints, Bulls Eye 1-2-3 and MOORWHITE oil-base primer, were a bit soft after 24 hours and could be scraped off. However, this was a short-term adhesion problem. After a few days of additional drying, adhesion improved to acceptable levels. To put this in perspective, I can say that in the past few years I have personally used Bulls Eye 1-2-3 primer successfully on home projects over partially cured epoxy without any adhesion problems. Another oddity that occurred to paints applied directly to partially cured (and still sticky) epoxy was “mud cracking”. We believe this paint crazing phenomenon occurs because paint films shrink as they dry. The paint doesn’t crack during normal use because it is usually applied to a solid. In this case, though, the paint dried on a semi-liquid (the partially cured epoxy) and mud cracks formed because the paint wasn’t physically attached to a solid substrate. We have seen mud cracking occur on projects at home and simply waited for the paint to dry and applied another coat of primer over the cracked sections. Because the epoxy was cured further, the paint did not mud crack again and adhesion was fine. Many primers can work well over WEST SYSTEM epoxy using a variety of surface preparation and cure situations. When possible, it is best to allow the epoxy to cure. However, primers are available that allow a one-day turnaround of repairs to painted wooden structures with WEST SYSTEM products. Armed with this knowledge, you can feel confident about using these primer products over WEST SYSTEM epoxy.